My interview with James Duncan Davidson covers the ins and outs of event photography. This type of assignment is challenging on any level. James is a professional photographer who specializes in big conferences such as those organized by O'Reilly Media and Apple's WWDC. But all of us can apply the lessons of pro level event coverage to our own assignments. Weddings, graduations, anniversaries, and other common assignments present many of the same challenges as big conferences. James and I cover both the technical aspects and the human relations required for success. Yes, you need to be able to work with the clients and assure them that everything is going well. But there is also a bit of a knack to helping attendees feel comfortable while you photograph them in action. We cover it all in this podcast. Now that I've piqued your curiosity, it's time to listen to today's audio show titled, "Event Photography." You can download the podcast here (30 minutes). 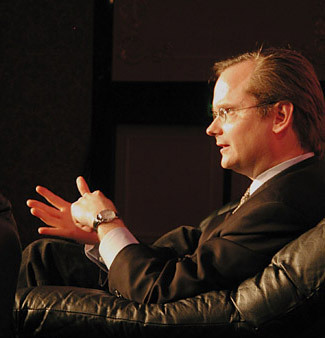 Photo of Larry Lessig speaking at an O'Reilly Conference by Derrick Story. If you're in Northern California on the weekend of October 7, stop by the Macintosh Computer Expo and sit in on my iPhoto 6 Tips and Tricks session. It's free, and I'll show you this tip plus lots of other cool iPhoto goodies. For those who really want to dig into some shooting techniques, stick around another day and sign up for my Digital Photography Made Amazing half day workshop on Oct. 8. But sign up early because seating is limited. The Custom White Balance setting is one of the most powerful features on your camera. Yet it is seldom employed because we're not sure how to use it. In this podcast, I describe the value of using custom white balance and techniques for putting it to work. 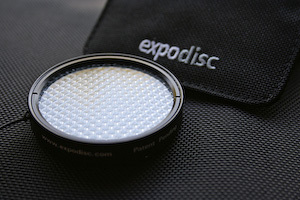 You can use something as simple as a plain sheet of paper, a coffee filter, or my personal favorite, the ExpoDisc. If you want to learn more about how to use the ExpoDisc, see my article on O'Reilly Digital Media. Regardless of how you employ custom white balance, it will save you post processing time and improve the look of your images. Now that I've piqued your curiosity, it's time to listen to today's audio show titled, "Custom White Balance" You can download the podcast here (28 minutes). Among my many eye-opening experiences in Iceland, I had a revelation about printing while participating in the reception at the Reykjavik Apple Store that final Friday. Instead of mounting our stacks of 13" x 19" prints and properly hanging them on the wall, we used removable Scotch tape and placed them haphazardly on the giant glass windows that illuminated the room. We also left some in stacks on counters where visitors could shuffle through them at their own pace. These choices helped transformed what could have been a somewhat staid event into one of artistic immersion. People would pull the prints off the glass, hold them, show them to others, take them to the photographers for signing, and ultimately cart one or two home. We weren't just looking at photography, we were touching it. You could hold the image at any angle you wanted, look as closely as you dared, and feel the texture of the paper while doing so. We had worked hard to output these snapshots of Iceland on Epson R2400s supplied by Epson as part of their generous sponsorship. But I don't think any us imagined the reaction to the images as they disappeared off the windows, through the doors, and into the Reykjavik night. I've brought this experience home to my own studio. Now, instead of putting barriers between my images and those who view them, I'm going to leave them laying around for anyone to touch. They only cost a few dollars each to make, and I can always output more if necessary. I learned many things in Iceland. But this one was a surprise. It seems so logical now -- letting people touch your prints brings them closer to your artwork. Now that I've piqued your curiosity, it's time to listen to today's audio show titled, "The Impact of Prints." You can download the podcast here (31 minutes). Setting up a model shoot can be easier than you think. In this podcast, I interview Maggie Hallahan as she describes how she put together the model shoot in Iceland. We had our chat the morning before the event, so neither of us knew how it was going to turn out. By many accounts, it went quite well. Now that I've piqued your curiosity, it's time to listen to today's audio show titled, "Setting Up a Model Shoot." You can download the podcast here (18 minutes). Here are 10 tips that you'll want to keep in your back pocket the next time you wander into the great outdoors. I've been using these tips for years, but had a chance to refine them a bit on my recent adventure to Iceland. The goal of field photography is to capture great images, enjoy nature, and do no harm to yourself and others. This list will help you accomplish the first goal. Know where your equipment is. Learn from what you've shot, then shoot it again. Now that I've piqued your curiosity about these tips, it's time to listen to today's audio show titled, "10 Tips for Great Field Photography." You can download the podcast here (26 minutes). Until recently, no photographer in his right mind would consider taking snapshots with a cameraphone. But the recent wave of high-tech handsets are featuring 2-3 megapixel sensors with autofocus lenses and sometimes even flash. In this podcast I explore one of the latest cameraphones, the Sony Ericsson W810i, and discuss tips and tricks for using these devices. Yes, they are now legitimate snapshot machines, especially when paired up with Bluetooth enabled printers that make output a cincch. Now that I've piqued your curiosity, it's time to listen to today's audio show titled, "Getting Serious with Cameraphones." You can download the podcast here (28 minutes). 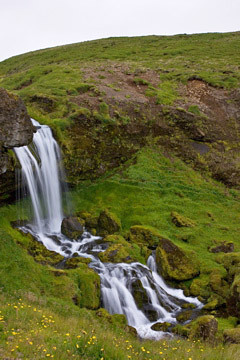 On July 27 I board a plane for Iceland as part of a team of photographers aiming to capture the beauty of this land and process the images using Adobe Lightroom. This project is really two adventures in one. The first is to work in the stunning but challenging Iceland landscape where the days are 22 hours long and weather is unpredictable. The second is to use a new workflow based on Adobe Lightroom loaded on to laptops for field use. There are many variables surrounding this project, and I don't think anyone knows how it's going to go. We've created a page that will cover the Adventure before, during, and after we return from Iceland. So you if want to find out more details, take a look at the official Adobe Lightroom/Photoshop Adventure 2006 site. In this podcast I talk about preparing for the trip to Iceland, provide some tips for traveling photographers, and interview members of the Adventure team. 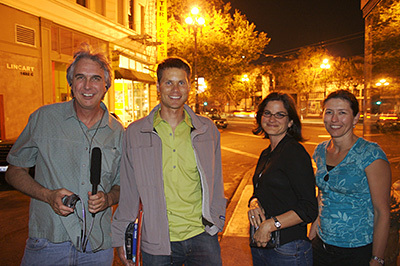 In the photo above, I'm on the left (with my portable recorder and mic), then Martin Sundberg, Angela Drury, and Addy Roff. 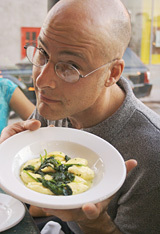 The photo was taken by Adventure photographer Richard Morgenstein (shown on the right). The team interview included in this show is informative, and I think will give you a good taste of the type of shooters going on this trip. Now that I've piqued your curiosity, it's time to listen to today's audio show titled, "Iceland Adventure" You can download the podcast here (27 minutes). Film can be an important part of your digital workflow. Even though you're starting out the process capturing "analog," it can be scanned at the time of processing and those images can be uploaded to your photo application just like original digital source files. In some situations, film can even be advantageous. For example, print film has a wide exposure latitude, broader than most digital cameras for sure. So in tricky lighting conditions, you can capture your highlights and shadows on film, then continue to "work" the scene later using the high resolution scan of the image. Your negatives also provide an excellent archive of your photos that's immune to hard drive crashes and optical disc deterioration. Plus, you can use camera gear you already have instead of having to invest hundreds or even thousands of dollars for the latest digital bodies. Now that I've piqued your curiosity, it's time to listen to today's audio show titled, "What About Film?" You can download the podcast here (28 minutes). Lenses are to a photographer what brushes are to a painter. In this podcast I discuss some of the attributes that you might want to keep in mind when researching your next lens. 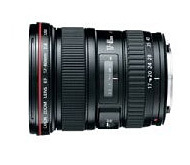 Features such as maximum aperture, zooming range, construction, and focusing speed can be the difference between loving your lens or owning an expensive dust collector. Keep in mind that a protection filter and lens hoods are more than just accessories, I consider them essentials. And if your lens is wide angle, you may want to investigate those special "thin" filters that don't cause vignetting around the edges. I've also launched a new feature on The Digital Story called My Favorite Lens. This is your opportunity to tell others in the TDS community about your "go to glass" and why you like it so. Now that I've piqued your curiosity, it's time to listen to today's audio show titled, "Great Glass." You can download the podcast here (24 minutes). Serious cameras should have serious features. Many advanced amateur cameras can fill the shoes of DSLRs, but in more compact packages. But not all advanced amateur cameras are created equal. Here are five features that I require on my serious cameras. Two "serious" advanced amateur cameras that meet these requirements are the Canon PowerShot Pro 1 and the Sony Cybershot DSC-R1. These are examples only and certainly not the only two advanced cameras that fit these requirements. 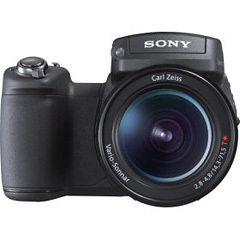 At the moment, the Sony is the higher rated of the two cameras and has better customer feedback on Amazon.com. Now that I've piqued your curiosity, it's time to listen to today's audio show titled, "Five Must-Have Camera Features." You can download the podcast here (24 minutes).